I've spied these colorful, circular wall adornments in several magazine spreads recently, and wondered what they were. Turns out, they're feathered headdresses called Juju hats from the West African nation of Cameroon, where they're worn by tribal chiefs and dignitaries during ceremonial events. 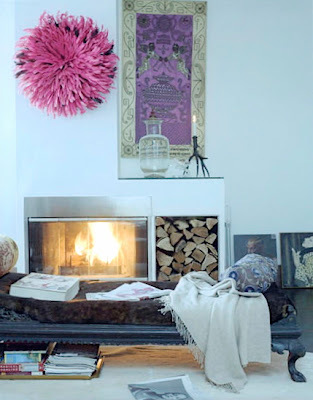 When not in use, the hats can be employed as wall hangings that add intense pops of color in an otherwise neutral space -- a decorative use that photo stylists in London and New York have clearly picked up on. 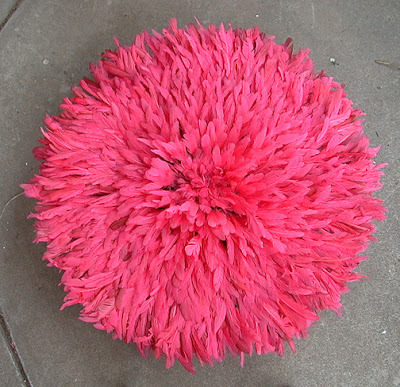 Though it would of course be far more fabulous to journey to Cameroon and procure one there, you can also find Juju hats online. 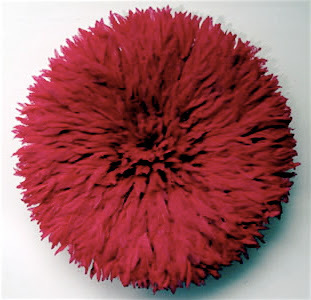 The pink one above, for instance, which measures 33 inches in diameter, is $325 from Authentic Africa. The red version below, not quite 32 inches, is $280 from Design My World. I used to work in a "high-end antiques" showroom in Atlanta and we would buy these from some African guy in a van. Sometimes they would have moths in them. They are made for the African tourist trade; however, they do have colorful, whimsical appeal. I've always wondered what they were and now I know!! Thanks! They look like giant chrysanthemums to me...very cool! feathers AND they look like dahlias?! i won't stop until i have one of these on my wall. thanks for a new obsession! Just freeze it periodically and that will kill any mites or bugs nesting in the feathers. All feathers attract insects. Wow, I wish paul had left a better comment, because it is the first one you see! I think they are a wonderful creation of something from nothing! 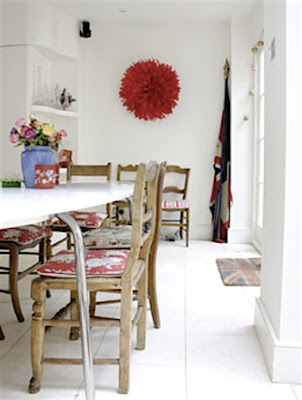 Feathers are around why not make them useful and beautiful after the bird is finished with them! The Bamoun People of Cameroon are noted for these lovely items! !